An exclusive live recording of a brand new Billy idol song, “Kings And Queens Of The Underground”, is now available for FREE DOWNLOAD in the Members area of billyidol.net. The song was written by Billy, his long time partner Steve Stevens, and the band’s new rhythm guitarist Billy Morrison. The recording was made in Slovenia last year during the band’s 2010 European Tour. 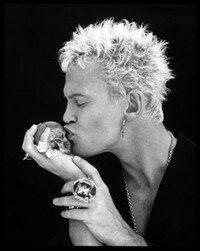 If you are already a member of billyidol.net, simply log in and listen to the song. If you are not yet a member, click the SIGN UP/LOG IN button, submit your details, and then VERIFY those details by responding to the email you will receive. Your email address that you use needs to be validated before it can be used to gain access to the Members Page.